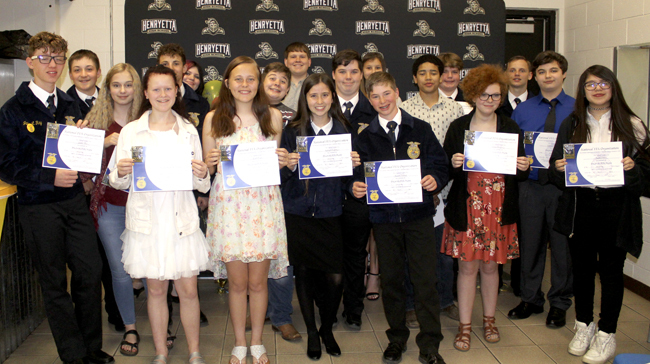 Henryetta FFA members celebrated the second year for the school program Tuesday night with a number of awards and honors being given. 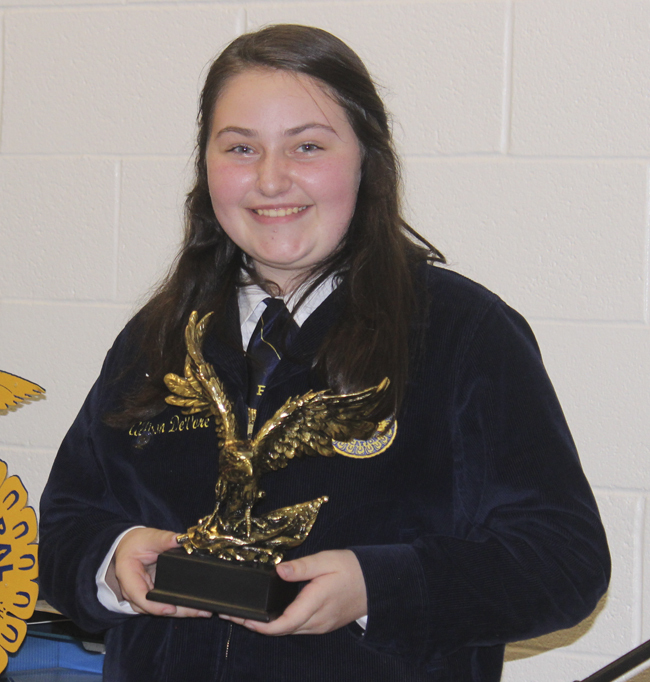 In front of over 100 parents, relatives, students and friend, Allison DeVore was named the chapter FFA member of the year. 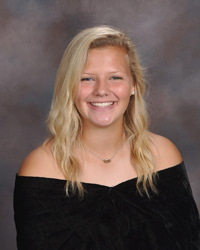 “She has an outstanding future,” said FFA advisor Cody Dawson. 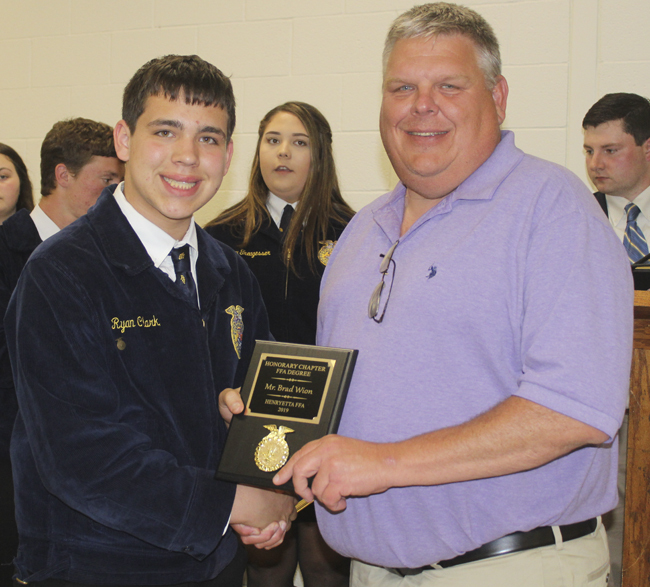 He pointed out DeVore was responsible for bringing in some new members to the chapter as well as accumulating over 1,000 state points. “The average points is 258,” he said. 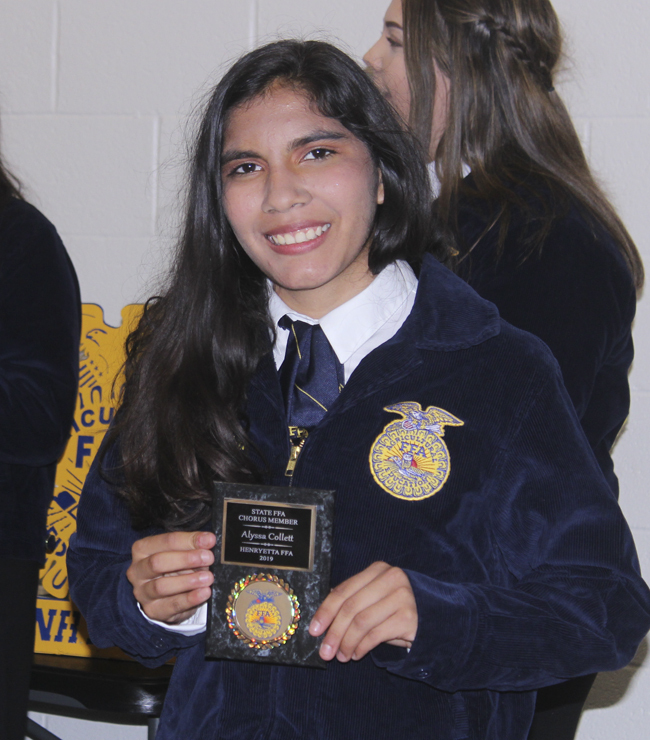 Devore was also honored as the state FFA proficiency finalist. 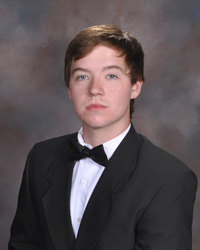 In the point totals, Dawson singled out, Austin Palmer, James Martin, Ethan Palmer, Aggie Gilliam, Jaxen Wright, Whitney Treagesser, Lottie Johnson, Brian Clark, Allison DeVore, Maddox Lackey and Huley Wincle for accumulating the most points in the chapter. 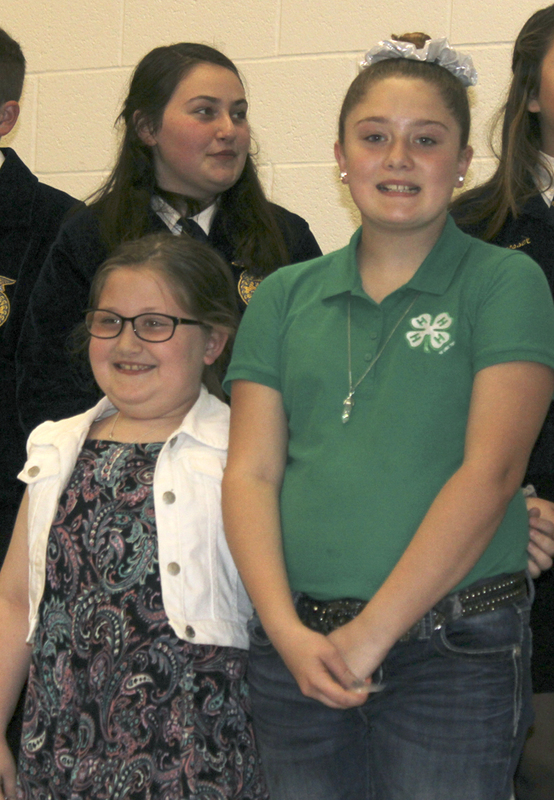 Receiving the Rising Sun award were Lottie Joslin, Aggie Gilliam, Huleah Wincle, Jane Britt and Maddox Lackey. 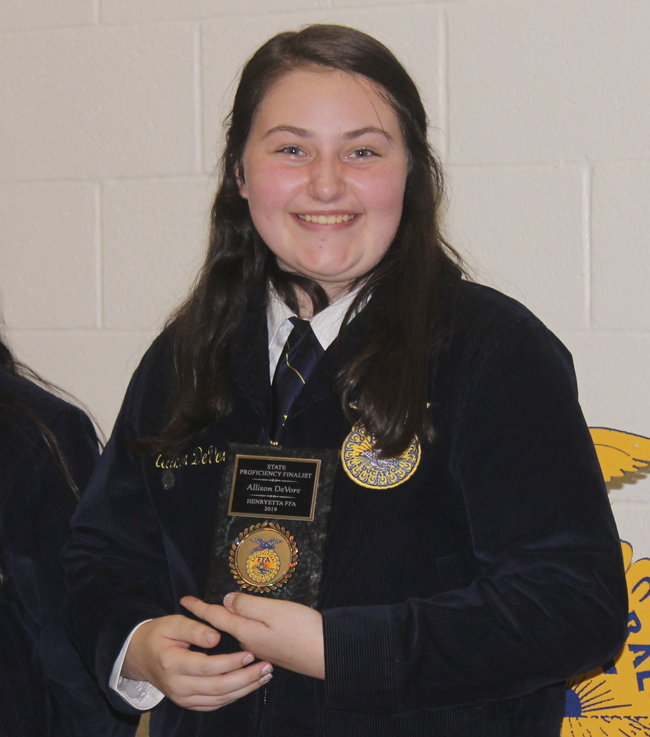 Alyssa Collett was recognized as the state FFA Chorus member. 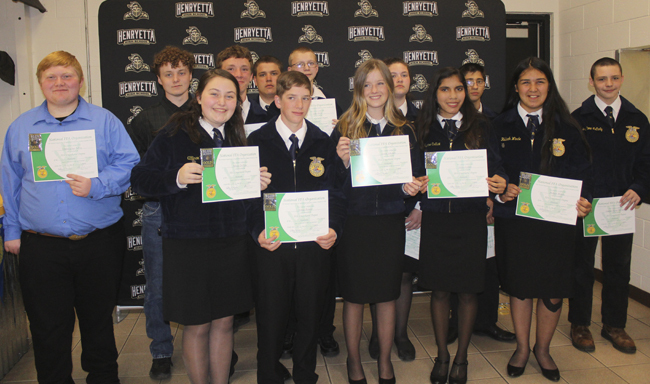 Star Greenhand awards went to James Martin and Allison Devore. 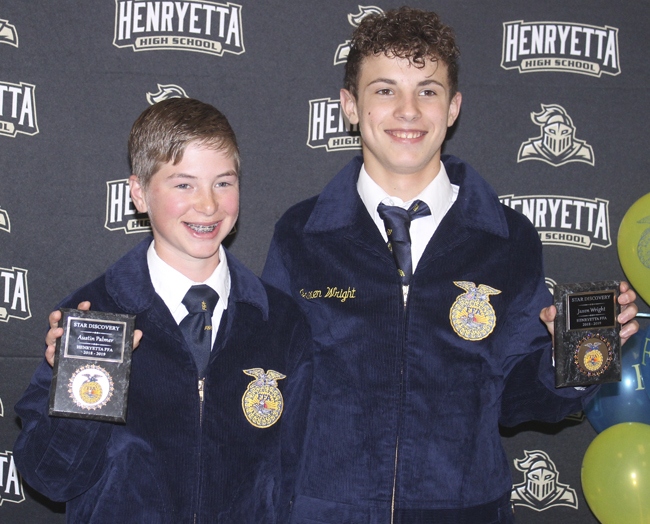 The Star Discovery plaques were awarded to Austin Palmer and Jaxon Wright. 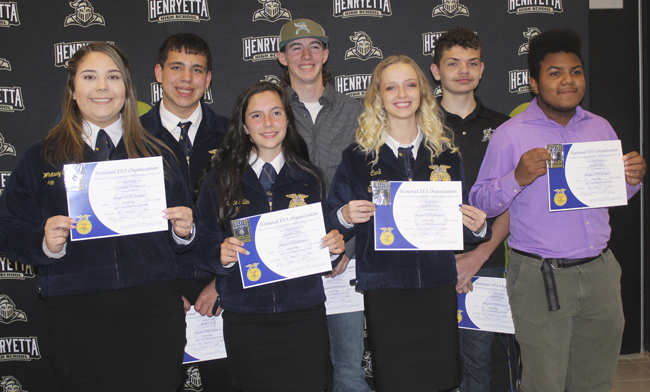 Chapter members selected Brad Wion and Kelly Furer as honorary FFA Chapter Members. 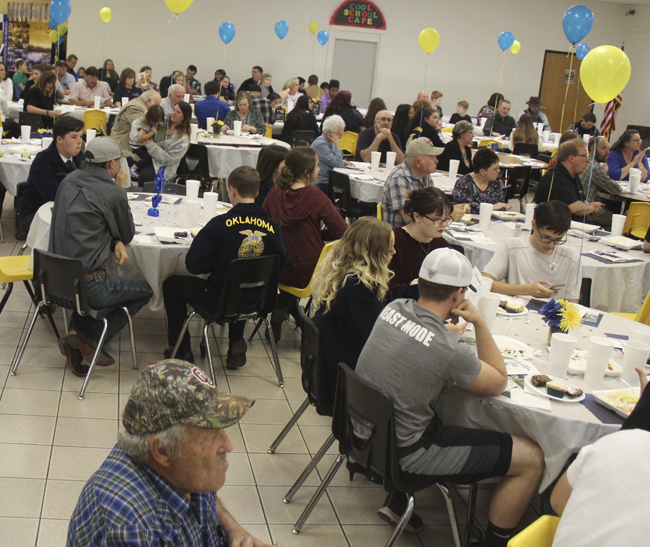 They recognized the work of booster club members James Martin, Melinda DeVore, Carlie Wheeler, Cheryl Gillam, Jamie Arnold, Monica Ray, Lacy Stidman, Rebecca Wright and Dirk and Rene Palmer. 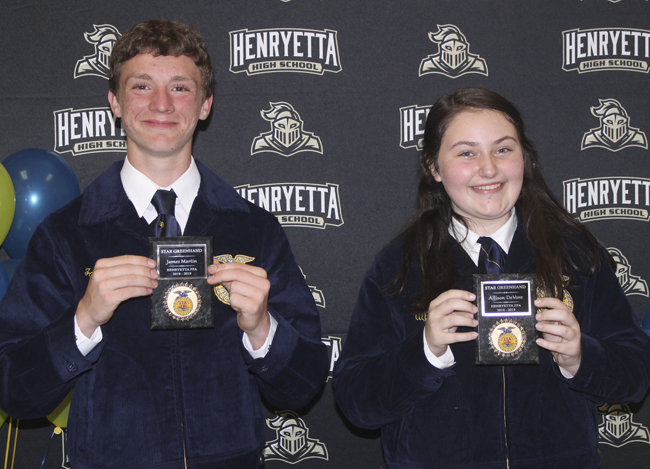 Carlie and Brandon Wheeler received the honorary chapter FFA degree. 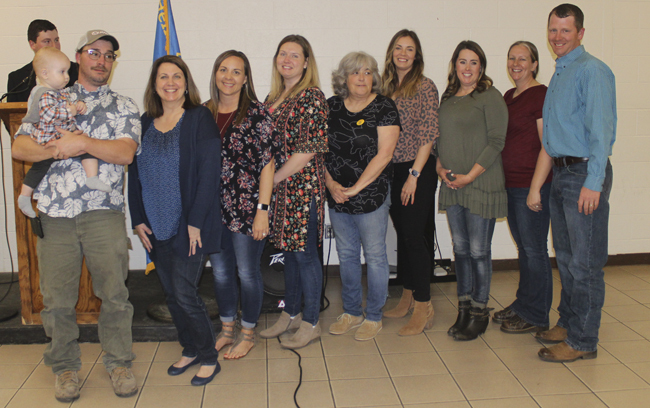 The start of the 2019-2020 school year is still some months away but parents wanting to participate in the Henryetta three-year-old program, pre-school and kindergarten need to start thinking about enrollment. Three days in May have been set aside for enrollment at the Henryetta kindergarten building. 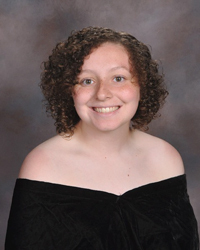 All three days, May 13, 14 and 15 will have enrollment from 9 a.m. to 2 p.m.
Parents must call 918-652-6587 Extension 1190 to set up an appointment with Mary Craft for each grade level class. To be part of the three-year-old program, the child must be potty trained, the parent must provide transportation and the child must be three years of age on or before Sept. 1, 2019. A developmental evaluation is needed and elementary school personnel can set that up. For pre-school enrollment, parents have to have an appointment and the child must be four years old on or before Sept. 1, 2019. New students enrolling in kindergarten must be five years old on or before the Sept. 1 deadline. The child does not need to attend the enrollment session but parents need to schedule an appointment time to enroll. Parents must bring proof of residence. That can be an electric, gas or water bill only or a signed affidavit of residents. Also an official state birth certificate, Social Security card, current immunization record, Sooner Care and Tribal Citizenship card if applicable, and any other legal documentation pertaining to guardianship. 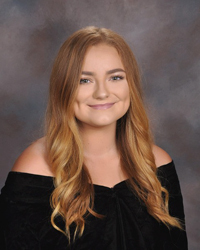 Valedictorians and salutatorians for the Henryetta high school 2019 graduating class have been announced this week. 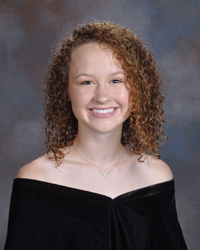 According to principal Kelly Furer, the valedictorians are Kenna Najera, Natalie Smith, Madison Walters, Colten Wion and Chase Whitfield. 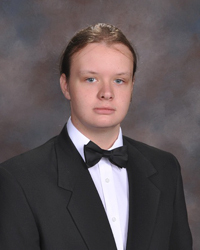 Salutatorians include Nicholas George, Brittani Hembree, Bayliegh Nye and Leah Vance. 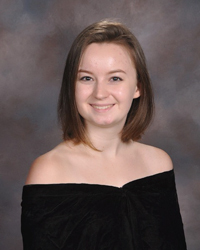 Valedictorians must have a 4.2 and above grade point average. 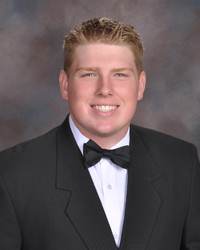 Salutatorians are required to have a 4.0 to 4.19 grade point average. 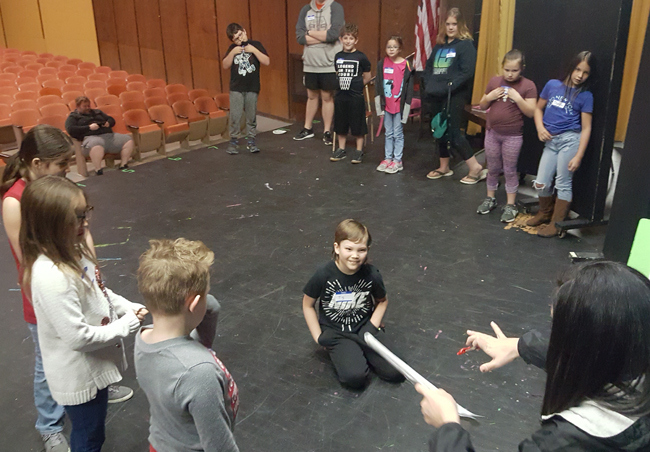 Leslie Montemayor Smith was the center of attention by Henryetta fourth graders this past week. 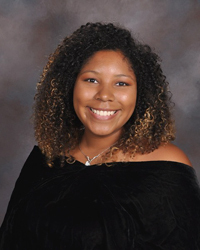 A teacher at Henryetta elementary, she also spends time as a member of the Army National Guard and was recently promoted to the rank of Sergeant First Class. 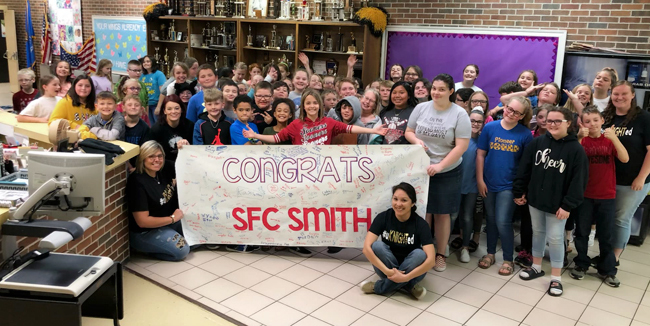 The students and fellow teachers were not about to let that occasion slide by so they gathered in the school entry way and surprised her with a banner and well wishes.